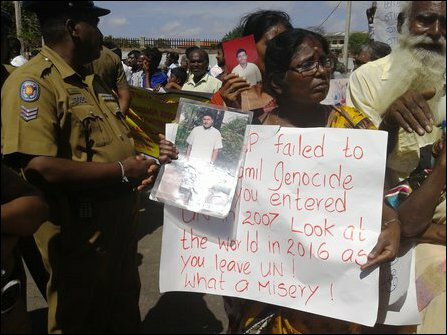 The outgoing UN Secretary General Ban Ki-moon, who was visiting Jaffna on Friday, was avoiding even watching the protesting victims, who had gathered in large numbers outside the District Secretariat. Mr Ban took a different route to meet Reginald Cooray, the controversial colonial governor of genocidal Sri Lanka, whose office is also situated close to the District Secretariat. After meeting the SL Governor, Mr Ban proceeded to Jaffna Public Library, again taking a back-route without showing an iota of interest in consoling the victims who had gathered there to express their despair on the genocidal State of Sri Lanka. 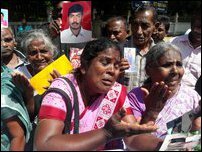 Ban Ki-moon’s eyewash visit to Jaffna foretells a plot for another round of deception at Geneva this month, political observers commented. 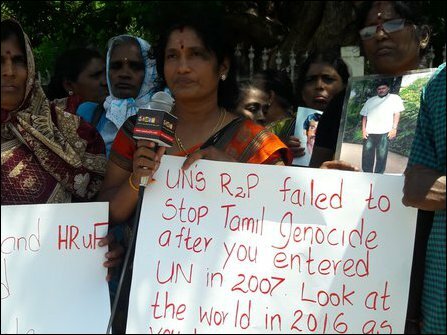 The victims, abandoned by the United Nations under his tenure between 2007 and 2016, were carrying banners demanding solutions based on the Right to Self-Determination and Tamil sovereignty. More than 600 of those attended the protests were families of persons subjected to enforced disappearances in the past. At the Public Library of Jaffna, Mr Ban met Opposition Leader R. Sampanthan together with TNA leaders and Parliamentarians in one session and the NPC Chief Minister C.V. Wigneswaran and his ministers at another session. The meetings lasted only for a few minutes. As expected, Mr Ban was not prepared for a dialogue or to listen to the Tamil opinion. He was only interested in passing the message of the Establishments that the Tamils should trust the Colombo government. 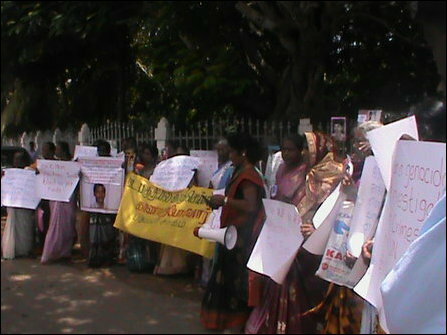 The protesters gathered outside the Public Library expressed their anger by refusing to listen to R. Sampanthan, who had to withdraw from the site unable to face the protesting victims. M.A. Sumanthiran was however busy with defending his position in front of the media amidst the protesters. In the meantime, some sections involved in the protests have been raising a false expectation as if Eezham Tamils were still having a ‘negotiating strength’ through exercising ‘soft power diplomacy’. 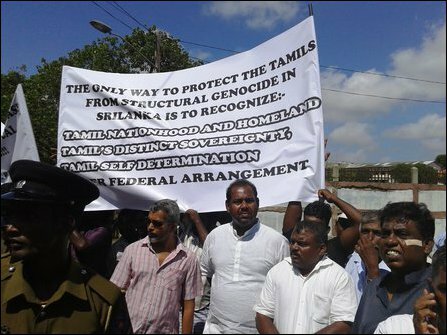 Their attitude was targeting to divert the public uprising to their short sighted political gains, commented independent watchers among those who took part in the protests in Jaffna on Friday. 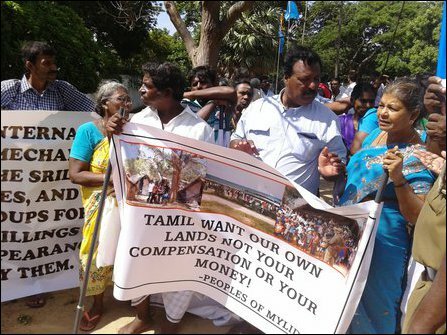 We are Eelam Tamil people who come from all parts of the Tamil homeland of the North-East of Sri Lanka and have been agitating outside all the venues that you are due to grace your presence with whilst visiting Jaffna today. We all comprise of organisations and individuals of affected Tamils. Despite the lapse of 7 years since the end of the war, and despite over 19 months since a new regime being formed in Colombo with the support of the Tamil people's votes, the plight of the Eelam Tamils have changed for the better in any significant way. Our lands that were illegally occupied by the Sri Lankan military during the war are now being permanently acquired against our will. We continue to be dispossessed of our privately owned lands due to the systematic militarization policies pursued by consecutive governments. Our areas all over the North-East are undergoing state sponsored colonization of Sinhalese with the intention of creating demographic changes and make Tamil minorities in our own homeland. Buddhist temples and stupas are being built by state and military backing in areas where no Buddhist reside with the clear intention of destroying the North-East identity of being Tamil in character. After the North-East facing continuous war for over 30 years, the Tamil people are placed in an economically disadvantaged position. The Sinhala dominated governments are using this reality to completely undermine and economically destroy the self-sufficiency of the Tamil people. The Tamil people's culture and history is also being systematically undermined through the educational system controlled Sinhala dominated governments. In other words, the Tamil people's existence in the North-East of Sri Lanka as a distinct Nation of People for over 2000 years is being systematically destroyed through a process of cultural Genocide. This is the reality today despite the new regime coming to power. 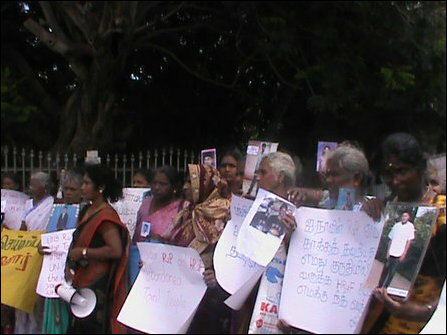 This coupled with the horrendous war crimes, crimes against humanity and Genocide committed against the Tamil people during the war and with even this present government assuring the Sinhala people that the Sri Lanka military and the previous regime shall be protected from any prosecutions of mass crimes clearly demonstrates the intentions of all Sinhala dominated governments in Sri Lanka. The Tamils People are a distinct Nation comprising of the Northern and Eastern Provinces as the homeland. The distinct sovereignty of the Tamil People. The inalienable right to Self-Determination of the Tamil People. We verily believe that a constitutional arrangement on the basis of the above can be arrived at through a federal arrangement that not only safeguards the unity of Sri Lanka, but also puts a complete stop to the Genocide that the Eelam Tamil Nation has been facing since the 4th of February 1948. In this regard we will like to refer you to the political proposals formulated by the Tamil People’s Council. 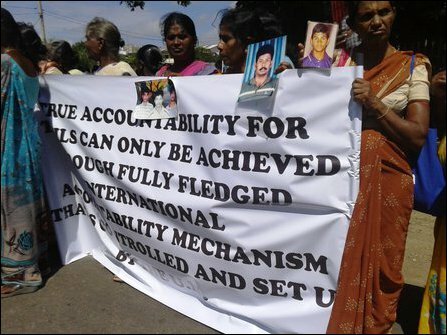 We also wish to reiterate our long standing view as repeatedly expressed at every election held in the North-East since May 2009, that as the victims of grave International Human Rights and International Humanitarian Law violations, that it is ONLY A FULLY FLEDGED INTERNATIONAL ACCOUNTABILITY MECHANISM THAT IS CONTROLLED BY THE UNITED NATIONS that will satisfy the Tamil people. WE HAVE ABSOLUTELY NO CONFIDENCE IN THE PRESENT MECHANISMS AND FUTURE MECHANISMS PUT IN PLACE BY THE SINHALA DOMINATED GOVERNMENTS.